The big red rock known as Uluru doesn’t need much of an introduction. It’s an Australian icon that so many of us never get to see because of its remote location (in the middle of the Simpson Desert which is in the centre of Australia). It wasn’t until I bought a van and started driving around the country that I considered visiting Uluru as a young person. It’s a 20-hour drive from Adelaide, or 22 from Darwin, which is why I think so many people put it off until they’re retired. 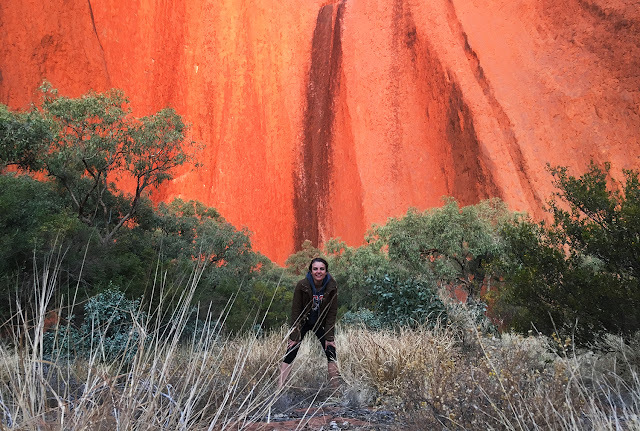 I didn’t know much about Uluru or what else there was to see and do until I arrived. The park and every hotel/motel is owed by a company called Voyages, meaning they’re literally your one-stop-shop for accommodation, tours, bars and restaurants. It made things pretty easy—yet very expensive—when it came time to book. 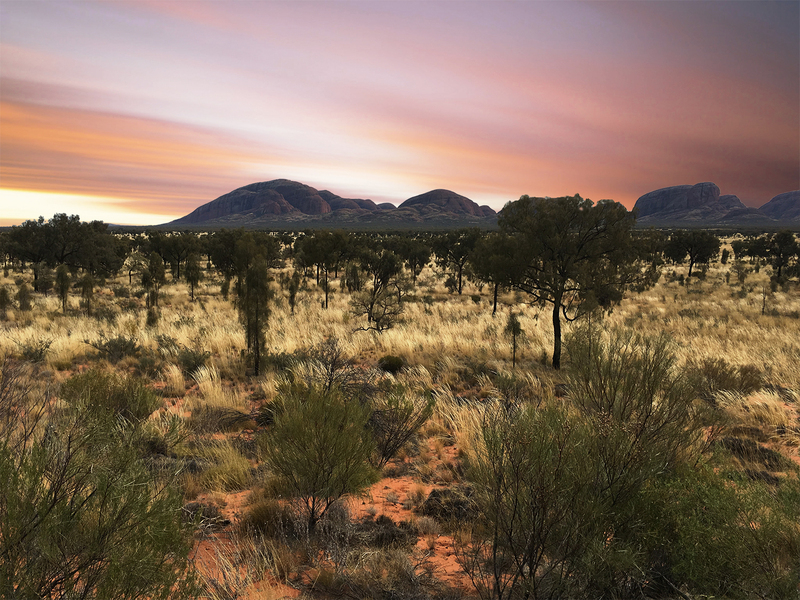 Kata Tjuta, previously called The Olgas, is a slightly smaller rock formation to Uluru and very different in appearance. When you pay the entry fee into the park ($25 per person for three days), you’re given access to Kata Tjuta which is 58km away. 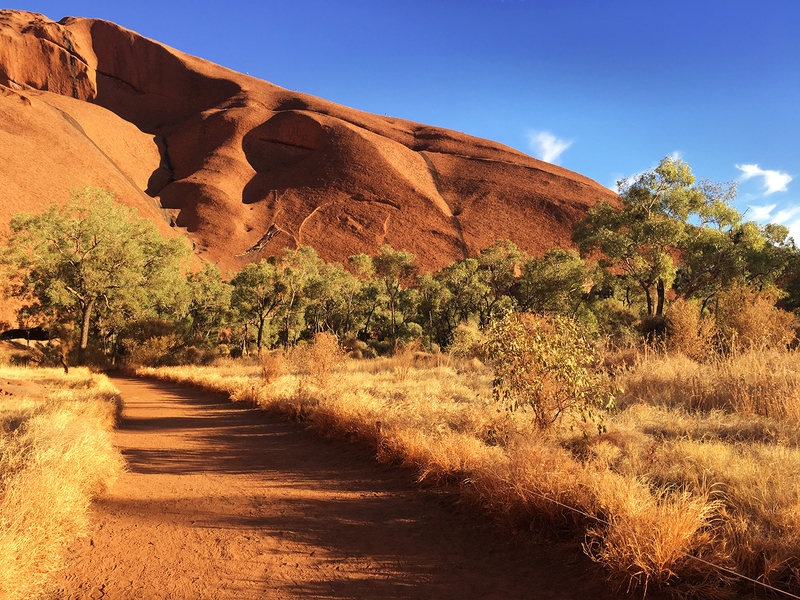 Unlike Uluru, people are encouraged to walk the trail, weather permitting. Red rock tip: Walk to the second look out point, then turn back and retrace your steps. If you keep going, the track will lead you around the outside of the rocks which is apparently much longer and a lot less spectacular. 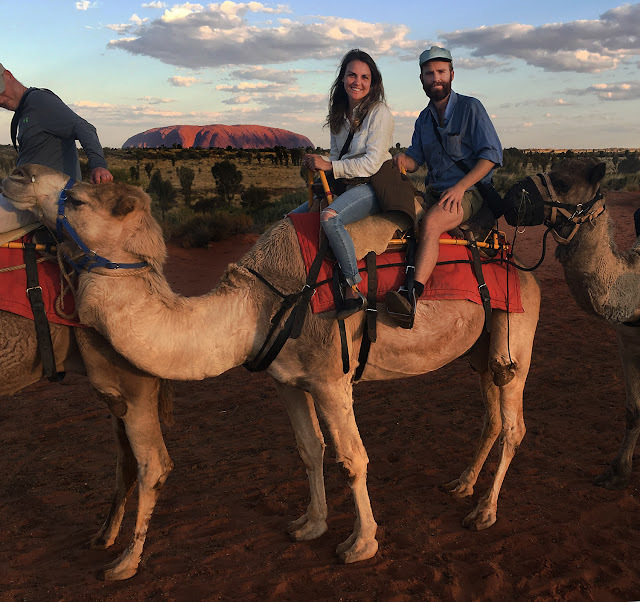 Uluru Camel Tours run four tours per day, but the sunset tour is the most popular. We called to book in the day we arrived and had to wait three days to get a spot. It’s $132 per person and lasts for about 1.5 hours. The camels are connected to each other so they can’t go rouge or move at a pace any faster than a slow walk. 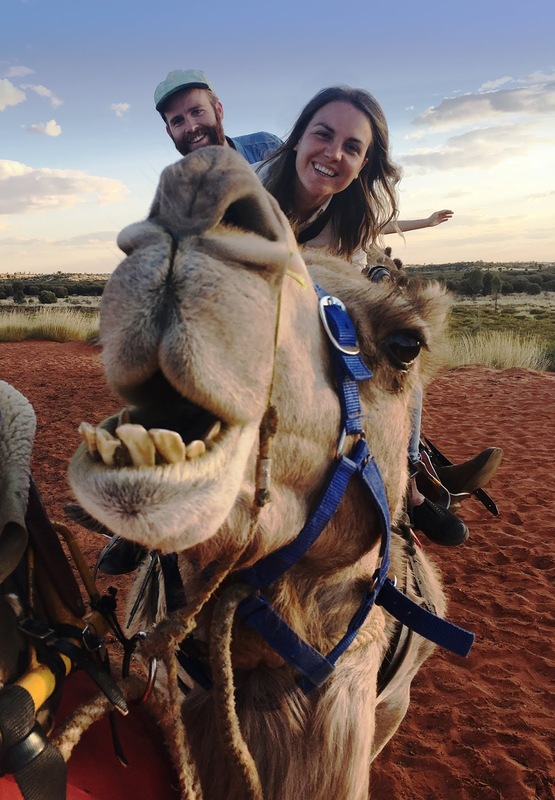 Our camel’s name was Spinifex. Some of them have muzzles because they nip and chew other riders; ours didn’t, but the one behind us did, which was disappointing when it came to taking photos. We named him Camel Lecter. Red hot tip: After the ride they serve hot beer bread and beverages, including beer and wine. They don’t really announce the fact you can return for as many drinks as you like within the 45-minute window. We only found out in the last 5 minutes, but had we known sooner we would’ve made sure we got our money’s worth. 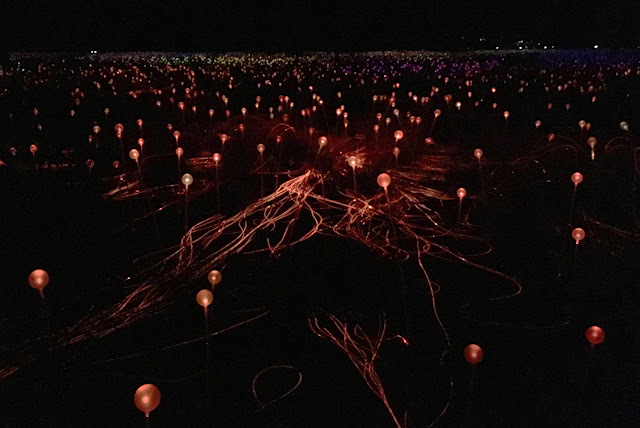 A UK artist called Bruno Munro created a colourful light installation made up of 50,000 bulbs and thousands of metres of fibre optic cable. You can’t go there by foot, so a coach makes three pick-ups from the roadside of each accommodation in Yalara. The earliest time was already booked out, so we went at 7:30pm. By the time we arrived the area was pitch-black aside from the flickering coloured lights. I felt a bit disorientated as I walked along the paths illuminated by white light. I think the photos on the advertising material are a bit misleading. There’s no way you can see Uluru given it’s so dark and the lights aren’t as colourful or bright as I expected. It was a nice experience but I don’t think it was worth $42 a ticket. Red hot tip: Book in to the drinks and canapes session at sunset. It’s about $30 more than the regular ticket but you’ll get to see Uluru in the backdrop and have a better understand of where you are and how the installation is set up. There are several roadside areas dedicated to watching the sun set on Uluru, all of which become packed full of cars during the lead up. We decided to go against the grain and stay at the base of the rock for sunset. We sat on a wooden bench seat made out of tree branches. As the sun weaved in the out of the clouds, the rock changed from brown, to orange, to red and even gold in some spots. Red hot tip: If you’re going to watch the sunset from one of the dedicated parking areas, plan to arrive an hour early to get a decent spot. Make sure you pack some drinks and nibbles to share around. There’s a base walk you can do around Uluru which takes between 2-3 hours. When the weather’s hot and dry you might prefer to do the Mala Walk which is a 1.5 hour a guided tour covering one section of the rock. 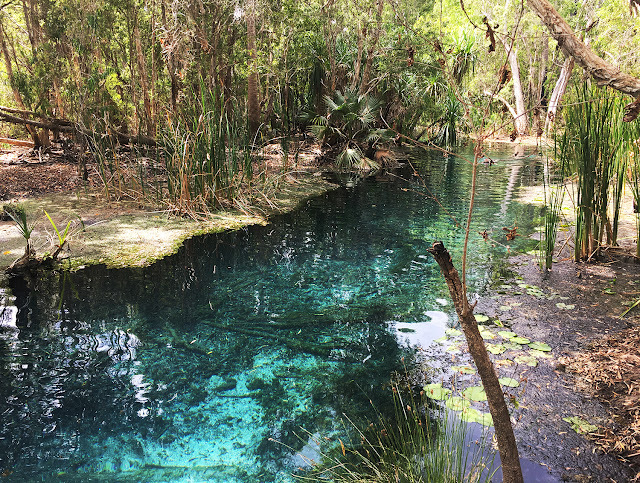 On the tour you’ll learn about some of the Aboriginal creation stories significant to the area, as well as the native flora and fauna. Red hot tip: Big groups will be split into two and appointed one guide each. On the day I visited, there was an Indigenous and non-indigenous guide. I consider myself lucky to have gone with the Indigenous guide because he was able to speak about his culture and teach us some words in the local language. Coober Pedy is the hidden gem of Australia, quite literally. It’s where miners come to make their millions from striking opal and the residents live in underground dugouts. The people are rich in character, culture and occasionally money. 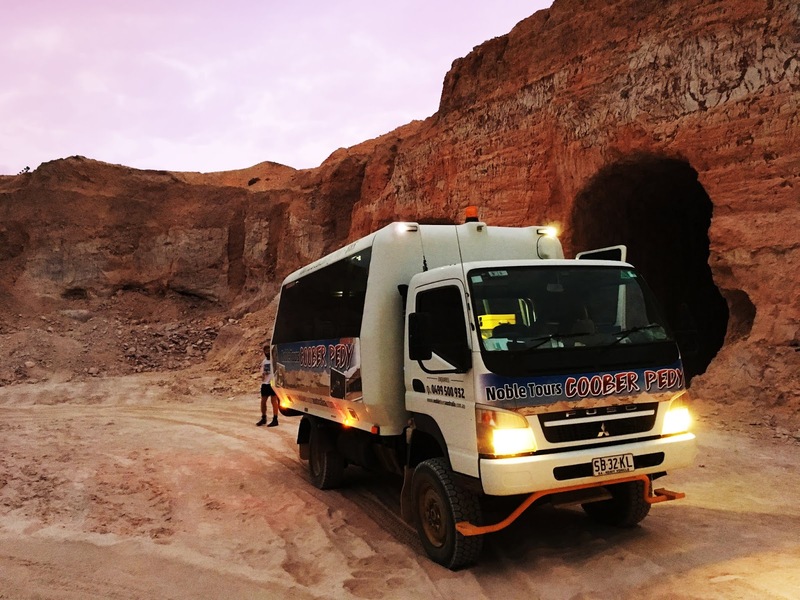 Find out why Coober Pedy is the small town with so much to offer! Tour one of the retired mines in town or get a personal tour of an active mine if you’re lucky. Visit one of the many underground churches and/or community halls built by religious and cultural groups. For many of which, the work was carried out by community volunteers. Chat to the opal shop owners and you’re likely to meet people who’ve lived in Coober Pedy for 30+ years. We met a handful of people in their thirties and forties who attended the local school and send their children there. 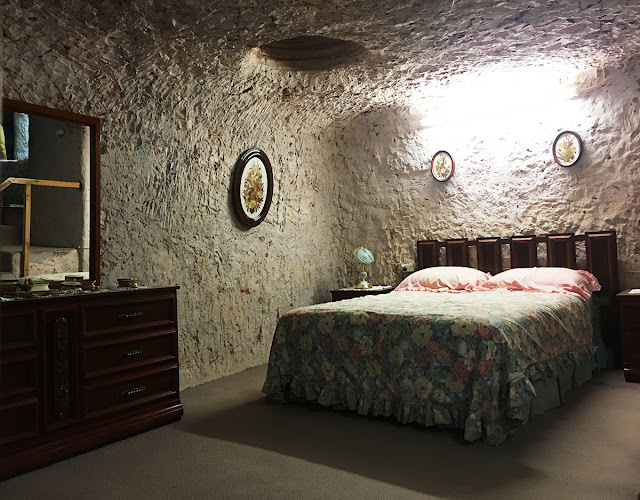 Visit or hear about the underground homes which have been carved out by hand, or extended by extreme proportions in search for opal. 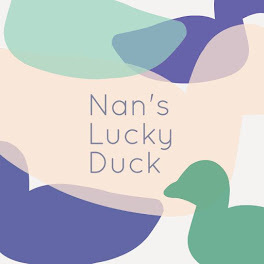 Ask a local to tell you one of the countless rags to riches stories. 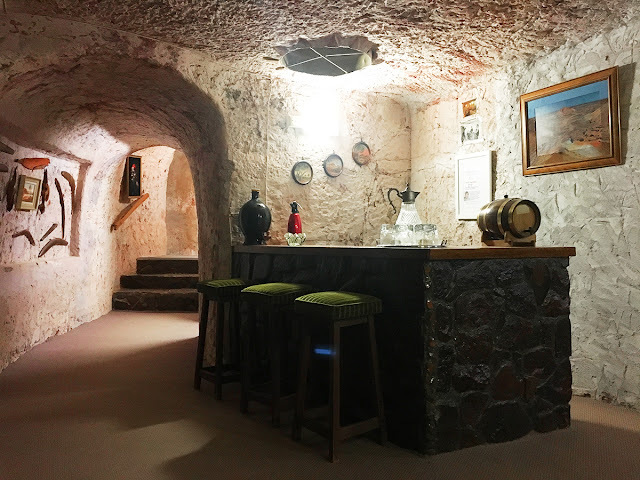 Over a drink you can hear stories of betrayal between opal miners which have explosive endings (lots of personal possessions have been blown up as a result of soured partnerships). Head out to the colourful Breakaways to watch the sunset. Count the number of above ground homes and try and figure out where the rest of the locals live (hint: why are so many white posts sticking out of the hills?). Find out why there are so many small and large mole hills of dirt along the Sturt Highway. We originally said we’d stay a night in Pimba to break up the drive between Port Augusta and Coober Pedy. But as we scratched around in the salt flats of Lake Hart, we entertained the idea of arriving that afternoon instead. “What’s another three hours behind the wheel?” I thought to myself, having just completed two in what seemed like the blind of an eye. We hit the road once more and I continued to belt out songs from the noughties while Dan read The New Yorker (I’m so envious he can read for hours without getting car sick). 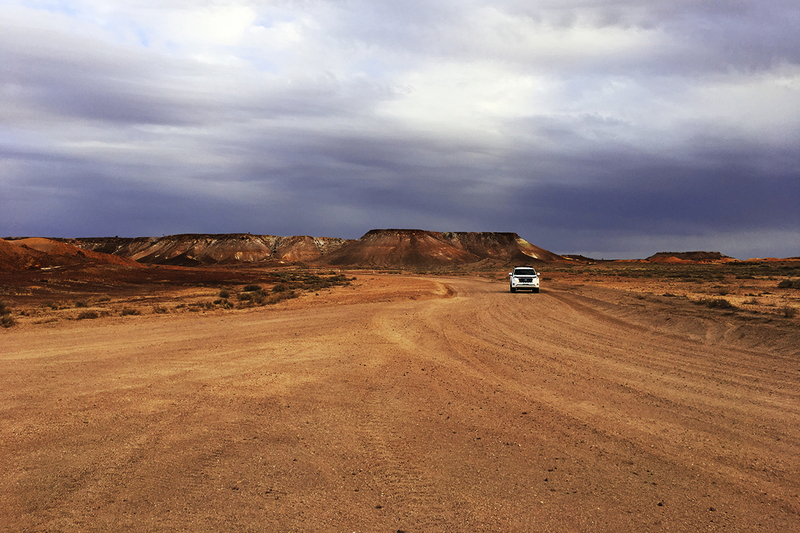 We knew we’d have to seek out a caravan park the moment we arrived in dusty Coober Pedy. We drove around some desolate streets wondering where all the local people were. Every few metres we’d be tailing a luxury motor home that would stop abruptly or turn without indicating. We booked into the lowest priced caravan park which was $32 per night for an unpowered site. It wasn’t all that surprising to find they charged 20 cents for a 3-minute shower—after all, we were in the middle of a desert. 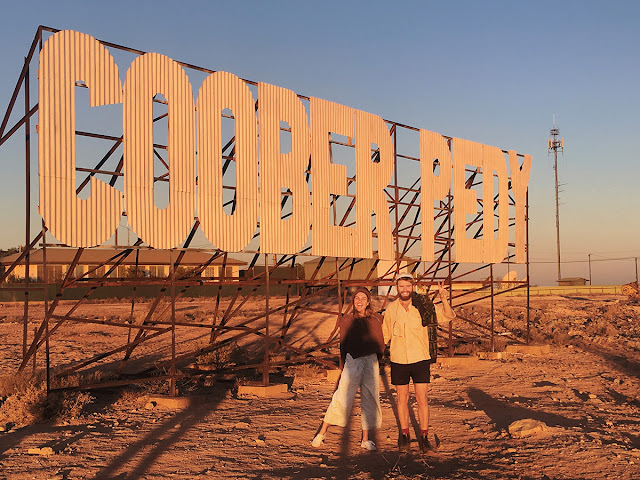 We were told the best spot to watch the sunset was by the Hollywood-style Coober Pedy sign. The block letters were cut out of corrugated iron and mounted onto a large rusted frame. We couldn’t work out how others got up there without walking through someone’s unfenced property, so we climbed the hill with speed and caution. After sunset we met what seemed like the only other young group of people in town and asked them to join us for pizza. While we chowed down on a large pizza (costing $30! ), they told us what it was like to tour remote Australia playing heavy metal music. The conversation quickly turned political which drained the last bit of life I had left. I slept well that night. The following day, we were picked up by Noble Tours around 1pm. It was a full house so Dan and I sat in the cab next to Aaron, the tour guide/operator. The vehicle was like a bus on steroids—it was a 4X4 with a body as solid as a dump truck. Aaron’s opening line to the dozen or so guests was, “So…what you think of Coober Pedy so far?” The passengers giggled like shy school kids, which I suspect Aaron was used to. He said he’d heard it described as “unique, quirky and different” time and time again. We’d been in town for less than 24 hours but I wanted to tell him I already loved it. Earlier that day, Dan and I walked the main street in search of interesting locals. We couldn’t believe how many unique characters we met each time we wandered into a store selling opals and souvenirs. The one that made me giggle the most was a man with a store full of handmade pen holders. Each large rock (not opal) had a biro lid and fake stemmed flower held down with a large dollop of glue. He also stuck magazine clippings to rocks and lacquered over the top to immortalise the faces of people such Karl Stefanovic and Donald Trump. When I asked him whether they were for sale, he told me they were only for customers who could give the rock to the person featured on it. Unfortunately, I walked out empty handed. The first stop on our tour was Umoona Mine, which is located in the centre of town. Inside there was a small museum and retired opal mine. I liked how Aaron walked us through the lot so we could bypass the information plaques; I tend to get a bit impatient when I know there’s interactive stuff further down the line. 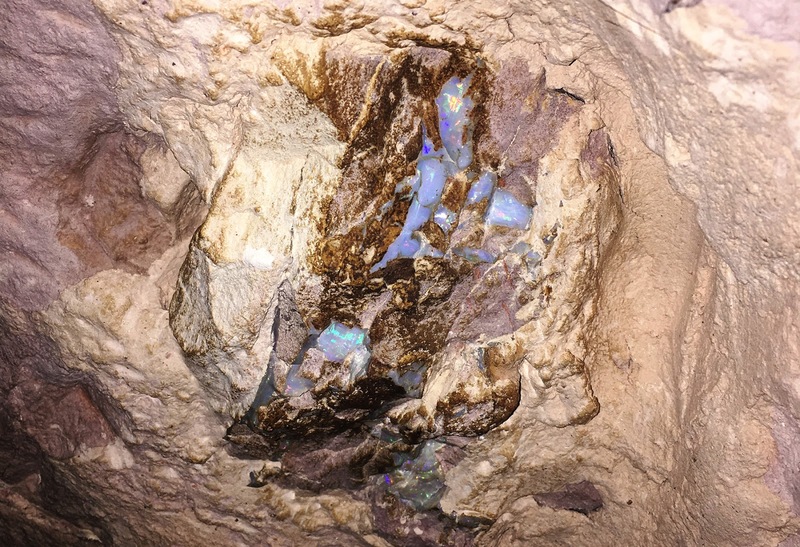 Within minutes we were standing in a large dugout with traces of opal in its walls. Aaron explained how “noodlers” use black lights to help them spot the opal among all the rubble produced by tunnelling machines. It was cool to think people originally used picks and shovels back in 1920, when the opal was first discovered in Coober Pedy. 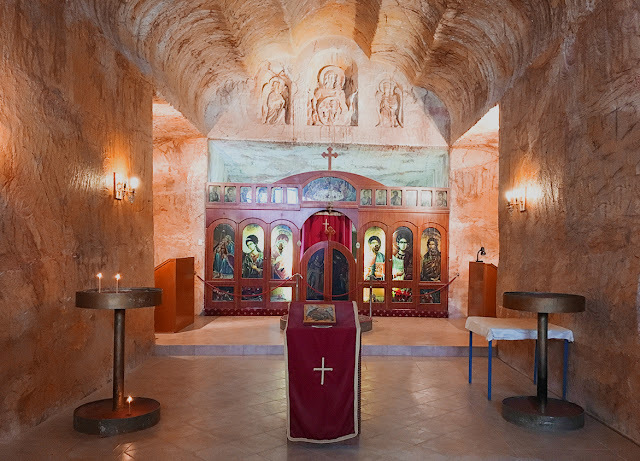 We visited a Serbian church with a spectacular interior. Apparently the man who carved biblical scenes into the sandstone made ice sculptures before moving to the desert. 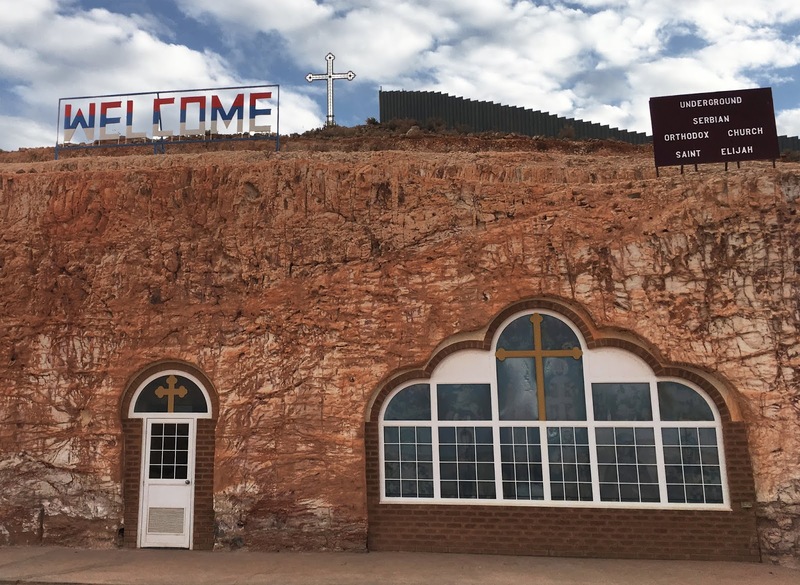 It’s hard to believe sermons are still conducted in underground churches throughout Coober Pedy on weekends. Only a few people on our tour lit candles while the rest of the group took photos from every angle. We stopped in for a tour of Faye’s House before driving out to The Kanku-Breakaways to catch the sunset. The story of Faye and her friends was inspirational to say the least. 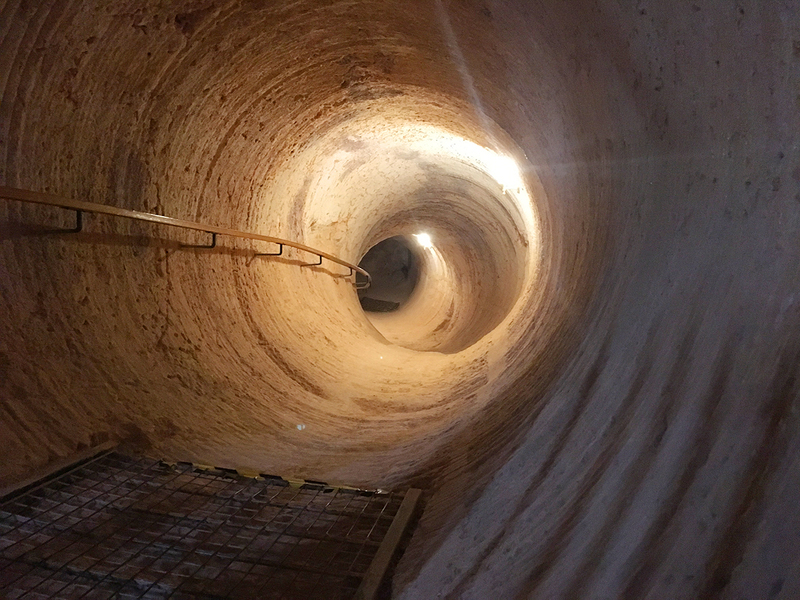 They spent 10 years constructing an underground house using picks and shovels. They even taught themselves how to wire the whole house up to a power generator, which gave them electricity years before the town built a power plant. Faye sold the property and passed away a few years after that, but the current owners (who reside in the house and open it daily to give tours) have kept everything the way it was, right down to the crockery in the display cabinet. My eyelids were feeling heavy during the drive out to the Breakaways; but I didn’t want to shut them in case I missed something out the window. Colours of pink and orange began to emerge as we got closer to the mountains. By the time we stopped by the roadside to listen to Aaron tell a Dreaming story, my view was awash with pastels mixed with pops of earthy tones. I started snapping away, as I couldn’t wait until we reached the lookout point. Everyone poured out of the bus once we reached the top of a hill. It was so windy my hair was blowing in every direction. By the time I got back from taking photos, everyone had honed into the cheese platter and the lady before me snagged the last piece of Brie. I munched on some crackers and cheddar to keep my appetite at bay while we drove 10km back to town. We didn’t arrive back to our camp site until 6:30pm, as Aaron from Noble Tours generously offered to show us his mining plot situated off the Sturt Highway. The pink powder from the rocks was so thick underfoot, I came back covered from the waist down. As I rinsed my sneakers under the tap and watched the pink water roll down the drain, I tried to recall everything we’d seen during the day. So many conversations and spectacular sights were buzzing around my brain. It was, and still is, difficult to pin down which one was my favourite. 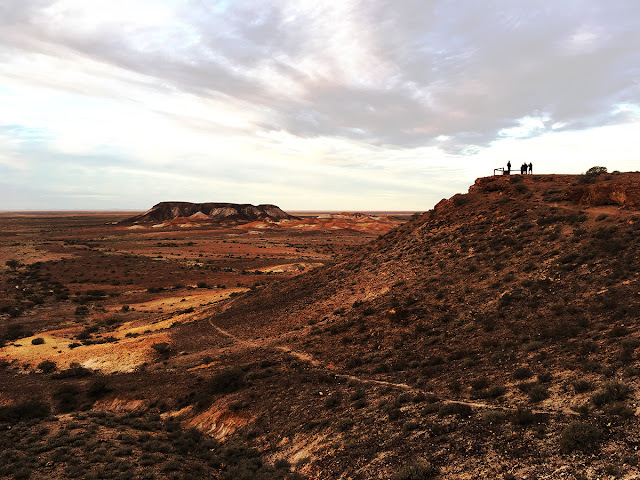 The next day I wrote a Facebook post urging all my friends to put Coober Pedy at the top of their travel bucket list and now you can too.